I have only been there once, but will never forget it and always hope to go back. I love it there and it seems no matter how many times I go I always discover something new! Last year I got to see two moose up close and personal on the trail around that lake! Wow! It’s an amazing shot. Was it cold? Thanks! The weather was perfect that day, mid-70’s! 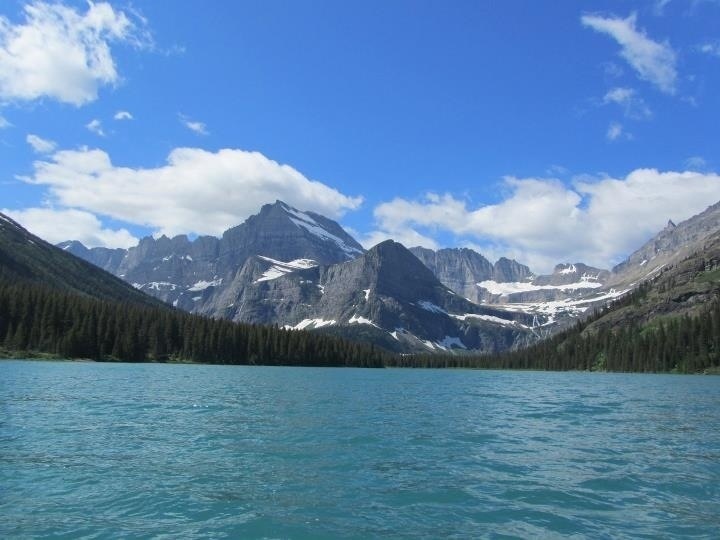 We ended up hiking back to another lake (Grinnell Lake) at the base of those mountains. Wow! I’ve never been there but looks like an amazing place to visit! It’s incredible! Prefect place to unwind, find an adventure, and just remember what’s important in life. Aw, wow! This place is amazing! It looks a lot like Lake Louise in Alberta! I want to visit this place! And I really want to visit Lake Louise & Banff! I hear it is very similar to Glacier. Exactly! A MUST see! Incredible! I found Jasper Alberta to be EVEN more beautiful, and less touristy! I was at GNP in May. Too soon, too cold, but I loved it anyway! July and August are usually best. Last year I went the last week of June and the Going To The Sun Highway still wasn’t open! I had a great time anyway and saw more wildlife than usual because it was still too snowy up top for them. Thank you! Me too! I am a mountain girl through and through!